hi everyone! 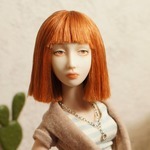 i am a girl from sweden,crazy about my two cats and have come into the hobby of dolls, i have some small art dolls and got my custom made porcelain bjd from forgotten hearts she is a 18 inch girl. i love her so much, had a small fhdoll and a male one witch both of them i sold. hope to have the possibility to collect more dolls ! Hello Nordicfairies- nice to meet you! Thank you so Much it warms to be welcomed ! Welcome to the forum! I just thought I'd let you know that I was the one who bought your Male FH doll. He's got pics here on the forum and I'm making him new clothes too. Great to see you here and I hope you have a good time! Hi nordicfairies, nice to meet you and see that there are others from Sweden!